Abortion and euthanasia are two sides of the same coin. Advocates of the death culture have long been connected to both the abortion and euthanasia movements. The pro-life community has warned society that the mentality that brought us legalized abortion would not end with killing in the womb. Euthanasia has become the logical progression for those who hold the pro-abortion view that some lives have value while others do not. And, believe it or not, euthanasia was introduced to American culture by the same eugenic proponents who cursed us with abortion. The philosophy behind pitting the life of the so-called “fit” versus the “unfit” — or the healthy versus the sick — has been around for decades. But few people helped spur this way of thinking like Margaret Sanger, founder of Planned Parenthood, which today kills over 300,000 preborn infants in the womb every year. Sanger was an enthusiastic proponent of eugenics and a member of the American Eugenics Society. The eugenics philosophy not only fed her work within the Planned Parenthood movement but also her lesser known advocacy of euthanasia. 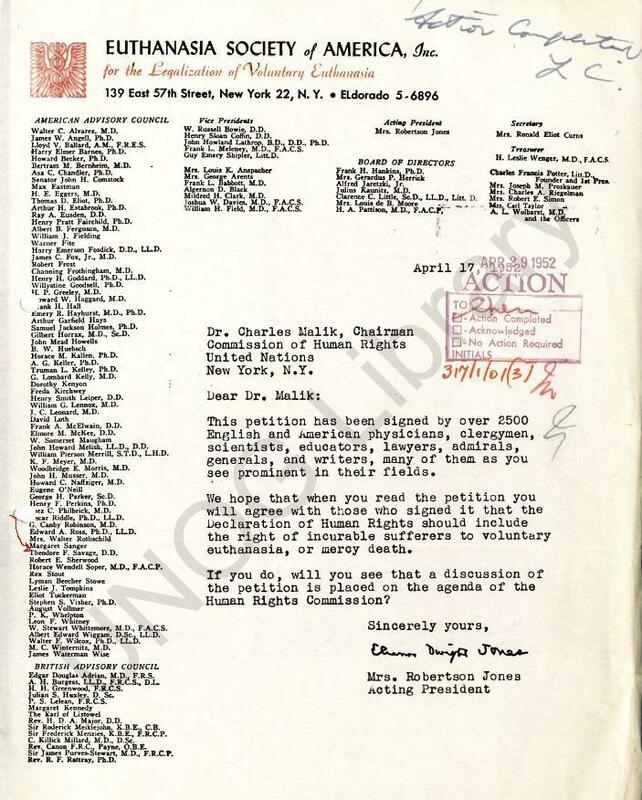 As you can see in the 1952 document below, on file with the United Nations, Margaret Sanger herself was clearly listed on the American Advisory Board of the Euthanasia Society of America. In 1938, just a few years prior to Sanger’s American Birth Control League (ABCL) changing its name to Planned Parenthood, a group of American Eugenics Society Members and members of Margaret Sanger’s American Birth Control League (ABCL) formed the National Society for the Legalization of Euthanasia. Potter was also on the ABCL Committee for Planned Parenthood. 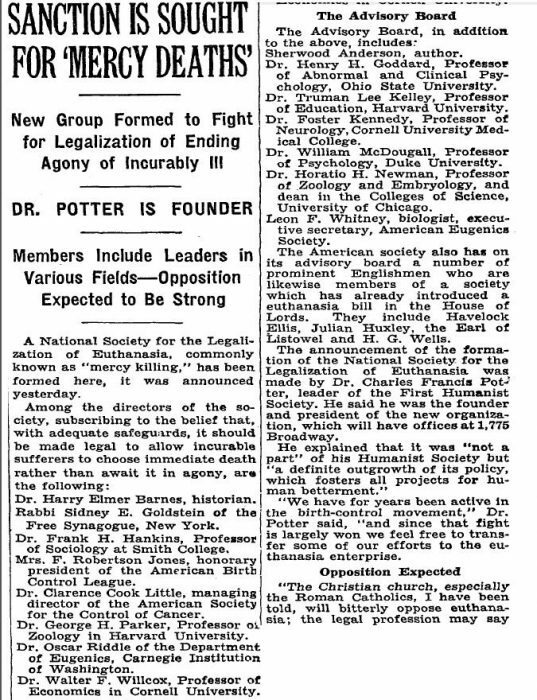 The first Humanist Society sponsor of the Euthanasia Society for years was prominent in the birth control movement, reported NEA Service in 1938. “That [birth control] fight is largely won and we feel free to transfer our efforts to euthanasia,” Potter told the media. • Henry P. Fairchild, who was a past president of the American Eugenics Society and a vice-president of Planned Parenthood. • Harry Emerson Fosdick, who was a recipient of the Albert Lasker Awards Given by Planned Parenthood in 1953. • Henry H. Goddard, who was published in Margaret Sanger’s book, The Case for Birth Control. • Samuel H. Holmes, who was on the National Council of the American Birth Control League, which would later become known as Planned Parenthood. • Frank L. Babbott (Vice President of the Euthanasia Society), who was a founding member of the American Eugenics Society. • Clarence C . Little, who was a founding member of The American Eugenics Society, board member of the American Birth Control League, Birth Control Federation President, and listed on the 1938 Committee for Planned Parenthood. • Mrs. F Robertson Jones, who was President of the Euthanasia Society, was also on Margaret Sanger’s ABCL board. • RL Dickinson, who was President of the Euthanasia Society and Senior VP of Planned Parenthood Federation of America. • Sidney Goldstein, who sat on the American Birth Control League’s National Council and later was on Planned Parenthood’s Board of Directors. • Frank H. Hankins, who was a managing editor of Margaret Sanger’s Birth Control Review as well as an American Eugenics Society member. • Julian Huxley was a recipient of the Lasker Awards given by Planned Parenthood – World Population. • Leon Whitney also sat on this panel. Whitney advocated forced sterilization, was published in Sanger’s Birth Control Review, and openly praised Adolf Hitler for his Nazi effort. In the past year, a litany of grisly exchanges from high ranking Planned Parenthood staffers devaluing the body parts of the children they aborted was exposed by the Center for Medical Progress. And it wasn’t long ago that a Planned Parenthood lobbyist testified before a panel that Planned Parenthood’s policy is not to assist babies born alive after surviving abortion, but to leave it to the mothers and abortionists to decide. This month, Belgium became the first country to permit the legal murder of terminally ill children at any age through state-approved euthanasia. The culture of death has come full circle from allowing the killing of the preborn to born children. 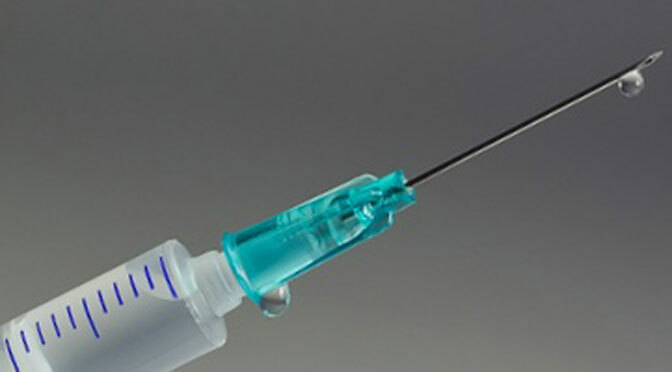 Tragically, the ideology behind euthanasia is no different than the ideology behind abortion. Both are deeply rooted in eugenics and both find their solution in death. The leap from advocating the killing of the most vulnerable in the womb to those who are born is not much of a leap at all. When you consider that those who advocated euthanasia were, from the beginning, connected to Margaret Sanger’s eugenic Planned Parenthood movement, is it any wonder that today we are witnessing the legalized killing of children after birth?